When I was at Sandhurst, many many moons ago now, the Directing Staff was very keen that I, and my fellow cadets, should learn and understand the Principles of War. Even then it struck me that I was unlikely to have to put them into practice for many years, if at all. Knowledge of them seemed more appropriate to the Commander in Chief of an army than to me, whose only ambition at the time, was to command a platoon in the Regiment of my choice. It seemed to me then, and still does, that it would have been more useful to teach us the Principles of Battle. But a theoretical approach to training was symptomatic of War Office thinking at a time before the Second World War: the Ten Year Rule, enunciated by the politicians, had lulled the Army Council into the belief that the war to end war had achieved its object: Imperial Policing and Duties in Aid of the Civil Power were to be our lot. Yet it was in these little actions all over the Empire that comparatively junior commanders were called upon to deal with situations which were never studied at the Royal Military College. In those days it was India and its North West Frontier that acted as a magnet to our imagination. So when I joined a battalion that had won undying glory and come near to annihilation in the Second Afghan War, I learnt as much as I could about the operations of the South Afghanistan Field Force in 1878 to 1880. I had no access to source materials and could only rely on official histories and the memory of the few survivors whom I chanced to meet. One in particular I remember well, an old man who had been a private soldier in the Regiment and had settled in Egypt, where he was butler and major domo to a retired official of the Indian Civil Service. A recently published and very readable book ("My God - Maiwand!") which has just come into my hands reminds me, not only, of the old man's reminiscences but also reinforces my opinion that the Principles of Battle should have been included in the instruction of potential officers. In the Kandahar campaign every possible mistake was made and Burrows' Brigade was defeated with heavy loss althoug h in ex-private Nunn's opinion "it didn't oughter have happened at all. We'd got them Paythans licked." This article is written with the advantage of hindsight, in comfort and without stress, without any feeling of smug superiority but in all humility to suggest some guide-lines to junior officers who, in the event of nuclear war, may well find themselves cut off from their own formation and commanding a mixed force in the face of a numerically superior enemy. It does not pretend to be a review of Colonel Leigh Maxwell's book, which tells the whole story of the activities of the South Afghanistan Field Force from the start of hostilities until Sir Frederick Roberts' battle of Kandahar put an end to Sirdar Ayoub Khan's pretensions. In order not to disrupt the narrative my observations are confined to an appendix cross-referenced in the text. Brigadier General Burrows consisted of a cavalry Brigade (3rd Sind Horse, 3rd Queen's Own Bombay Light Horse and E Battery of B Brigade RHA) under command of Brigadier General Nuttall, and Burrows' own infantry Brigade (HM 66th Foot less two companies, 1st Bombay Native Infantry (grenadiers), the 30th Bombay Native Infantry (Jacob's Rifles) and a company of the Bombay Sappers and Miners)1. This made up a fighting strength of one thousand eight hundred bayonets five hundred and fifty sabres and six 9-pounder muzzle-loading rifled guns. Its task was to support the army of Wali Sher Ali Khan who was marching against the Sirdar Ayoub Khan, Governor of Herat. The troops left Kandahar on 4 July 1880 and reached the East bank of the Helmand river, eighty miles away, a week later. A few days afterwards, most of Sher Ali Khan's army mutinied and set off Northwards up the West bank, dragging their smooth bore artillery with them. The column commander realised that it was vital to get at the mutineers with the utmost speed but he had encamped in a defensive position where the Helmand River was deep and unfordable. Instead of sacrificing a little time to get his command across the river as a cohesive formation, he committed it to action piecemeal as each squadron could find its way across a difficult ford. Nevertheless, the action was successful, the six guns captured and the infantry put to flight after a bayonet charge by a half company of HM 66th Foot, who had "stormed their . way into a walled garden where they shot or bayoneted the defenders". He now received the following order: "You will understand that you have full liberty to attack Ayoub if you consider you are strong enough to do so. Government considers it of the greatest political importance that his force should be dispersed and be prevented by all possible means from passing on to Ghazni." Only an hour had passed when the first halt had to be called to allow the baggage animals to catch up. This was repeated at Mashak where some officers had breakfast, and men and horses watered. Only the sepoys of the Grenadiers were not allowed to leave their positions to fill their water bottles. Then came information that Afghan horsemen were moving across the column's front and that their cavalry had reached Maiwand. Meanwhile Ayoub Khan had seen how small was the force before him and decided to surround it with his cavalry and then attack it from all sides at once. The battle began shortly before 11 o'clock when our artillery opened fire on any target that appeared, but with little effect. The heat haze and the dust made accurate observation difficult. "For half an hour the Afghans fired nothing in return, employing the time in closing up the regular infantry and bringing the artillery forward from the rear. The batteries moved up slowly and carefully, making good use of every rise and dip in the ground to conceal their approach, which was masked not only by dust and haze, but also by the journeyings hither and thither of the rest of their army. At a quarter past eleven they were in action, for the most part unseen by the British." It was not until an hour later that Burrows formed his infantry into position. Until then they had been lying down behind the guns. Only the Sappers and Miners had dug themselves in, presumably as only they had the means to do so. The first Afghan attack was by the fanatical Ghazis against HM 66th, which met it with controlled fire by companies which halted even these dedicated warriors. Some sought cover and some edged to their left, overlapping the right of the British line. Colonel Galbraith threw back his right company to face this fresh threat but it was clear that a new and more determined attack was being prepared. Harris, the DAQMG got permission from Burrows to move two of the 6 pdrs to strengthen the 66th line. When the Afghans did attack they were "met with a shattering fury of Martini Henry and artillery fire which swept them from their feet and drove them helter skelter back whence they had come". Whilst Burrows was trying to strengthen his line, Ayoub was moving up his artillery and infantry under cover to get into position for the kill. The next attack came from the Kabuli infantry regiments, who tried their luck against the main body of the Rifles. They were made of sterner stuff than the Herati's and when they were checked by fire "began to crawl forward in extended order to form up under some unsuspected cover closer to the British Line". Whilst the column was everywhere holding its own, and more, in front. Major Ready, commanding the Baggage Guard, was dealing with loot-hungry Afghans who had worked round his flanks. Detachments of all three infantry regiments cleared the enemy from the Mundabad ravine and occupied the village. Colonel Malcolmson of the Sind Horse, whether on Burrows' orders or not, we do not know, ordered the successful detachments back to their original positions and told Major Ready to retire the leading baggage animals across the ravine. This movement to the rear emboldened the enemy who occupied Mundabad in greater strength than before and caused panic among the camel drivers, many of whom fled with their animals and left the remainder "massed in utter confusion from which it was almost impossible to extricate them". The crisis of the battle came just before one o'clock. The British Force was disposed roughly in a horseshoe formation in an open plain. Around them swarm·ed the Afghan army. To their right rear were the villages of Khig and Mundabad, surrounded by walled gardens, which would have provided a good defensive position and where water was available. Also in the vicinity under cover were a quarter of a million rounds of small arms ammunition and five hundred rounds of shell and case for the 9-pounders of the Horse Artillery. Between this haven of safety and the British battle position was a mile of undefended territory across which ammunition and water must come, but was open to forays by the Afghan horse. 15 Burrows had two alternatives open to him: to risk a withdrawal to Mundabad or to remain where he was in the hope that the Afghan army would attack again and once more be driven off by fire. He chose the latter alternative, probably because he dared not risk moving Cole's companies. What he did not realise was that a deep dry watercourse wound parallel to the British line, in some places only two hundred and fifty yards in front of it, which was now filling with Afghan guns, regular infantry and Ghazis. "Its banks are flush with the plain and its course cannot be traced from the British line even on a clear day". At half-past-one the smooth bore battery ran out of ammunition. Its commander, Slade, having sent officers to the baggage lines to find his reserve of shells without avail "took the extraordinary step of ordering his whole battery to go back and collect it! "The effect of seeing the British guns withdraw was disastrous to the morale of the Indian troops and gave a tremendous boost to that of the enemy. It will be remembered that Burrows had under command a cavalry Brigadier General, Nuttall, and two regiments of horse. Some squadrons had been used in a dismounted role to prolong the left of the horseshoe, some were with the baggage guard and some remained mounted under fire, awaiting orders which did not come. When one squadron commander asked a staff officer to get orders from the Force Commander he was told "that he could withdraw from where he was and go to whichever flank needed him most. He might have expected more specific order". 16 Nuttall saw some Ghazis who had infiltrated round the right flank of HM 66th and ordered, or more probably led, a squadron to charge and disperse them. After a few hundred yards, he changed his mind and ordered their return; he had remembered, or been reminded, that there was a dry water course in his path, deep enough to break up his charge. This abortive charge further raised the enemy morale. 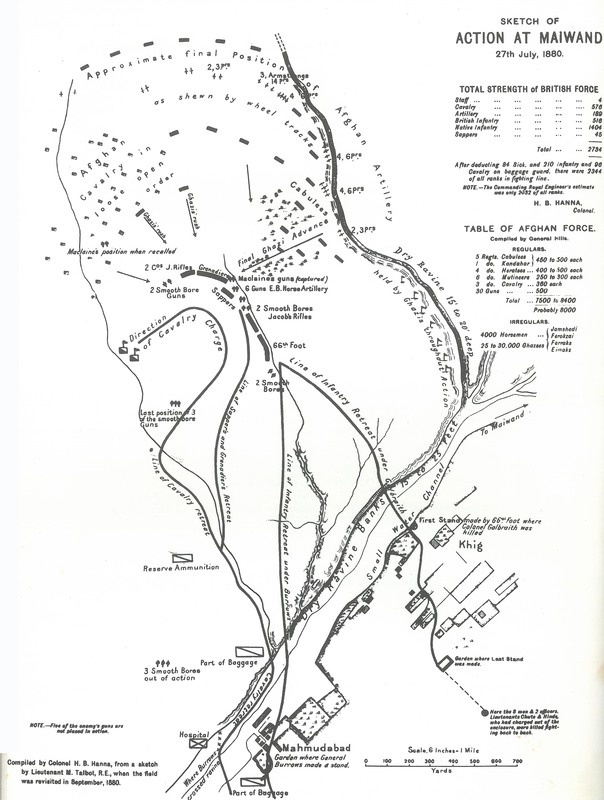 Their infantry and cavalry had overlapped both horns of the British fighting line and penetrated between it and the baggage park. Casualties were mounting on both sides, but the Afghans could afford them , the British could not. Moreover their rifles were almost too hot to hold, their ammunition was nearly exhausted and the blazing sun was beating down on men, long since dehydrated from lack of water. Then Ayoub ordered his guns to cease firing and his whole army to charge home. Only HMs 66th could stem this avalanche of fanatics. The two Native Infantry Regiments broke. The gunners, bereft of their infantry support, tried to save their guns but had to abandon two of the 9-pounders. Then the cavalry received orders to charge, but once again Burrows' orders were vague and half the cavalry went one way and half the other. Nuttall appears to have given no orders at all. After a few minutes, during which his manoeuvre had increased the confusion behind the British right, he left the field, with the portion of his regiments which he could collect, in the direction of Mundabad. An extract from Major Ready's report describes the scene from the Baggage Guard: "I now saw numbers of men - mostly sepoys - passing to our rear in twos and threes; some of these men joined the baggage which was then retiring; but the. majority made for the hills, looking, I presume, for water. 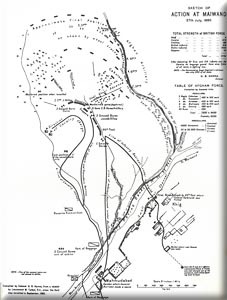 Captain Quarry's company covered the retreat in skirmishing order and a few of the 1st and 30th Native Infantry, with some other men whom I was able to collect, also formed part of the general line. Captain Slade RHA now called upon us to support him and came into action firing several rounds with excellent effect. The enemy did not maintain a vigorous pursuit. At about 5.30pm their guns ceased firing, and after that I consider that the pursuit ended. " It had indeed, and for two reasons. The first was that practically the whole of the baggage of the Brigade, scattered over the countryside, was an irresistible temptation to the Afghan horse, who concentrated on the loot and left the weary, thirsty infantry to struggle back to Kandahar. The second was the courage and discipline displayed by HM 66th Foot and about forty officers and men of the Bombay Presidency units . Colonel Galbraith had about one hundred and ninety men with the colours at his first stand, but casualties came fast and he withdrew in good order, making two further stands in the gardens. Their desperate resistance held up the whole of Ayoub Khan's left and most of his centre while Burrows' party got clear away. T heir end is best described in the despatch sent by the General Officer Commanding in Kandahar to the Commander in Chief in India: "I have it on authority of a Colonel of Artillery in Ayoub Khan's Army who was present at the time, that a part of the 66tfzRegiment which he estimated at one hundred officers and men, made a most determined stand. They were surrounded by the whole of the Afghan army, and fought on until only eleven men were left, inflicting enormous loss upon the enemy. These eleven men charged out of the garden and died with their faces to the foe, fighting to the death; such was the nature of their charge and the grandeur of their bearing, that, although the whole of the Ghazis were assembled round them, not one dared approach to cut them down. Thus standing in the open, back to back, firing steadily and truly, every shot telling, surrounded by thousands, these eleven officers and men died; and it was not until the last man had been shot down that the Ghazis dared advance upon them. He further adds that the conduct of these men was the admiration of all who witnessed it. From an examination of the ground, from corroborative evidence and from the position in which the bodies were found, I have not the least hesitation in stating that this is true; and I think that His Excellency will agree with me when I say that history does not afford any grander or finer instance of gallantry and devotion to Queen and Country than that displayed by the 66th Regiment on the 27 July 1880."